I'm not saying that these are the only elements of my happiness - I do have the son and the husband and the nice life and all, but let me tell you, around 6ish every evening or so, these elements play a very important part in keeping me happy. Now let me tell you a little bit more than you ever wanted to know about my evening cocktail. I usually buy gin in a plastic bottle - for some reason it is more pleasing to me than gin in a glass bottle. 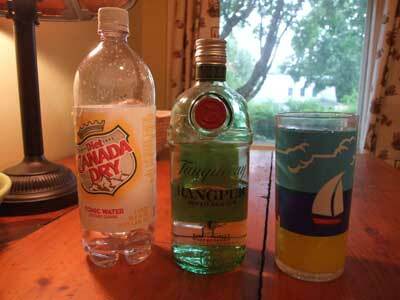 I always have my evening gin and tonic in one of those plastic glasses with the sailboat on it. There's a fence on the other side - I know to fill up the gin to the bottom rail of the fence. I bought them about 20 years ago for my grandfather's shore house and then inherited them back when he died. The weird thing about the plastic gin bottle and the plastic glass is that I've basically eradicated as much plastic as possible from my life. I love glass, but my evening gin and tonic must be in that stupid plastic glass. I started with six of them and five of them have cracked over the years, so I am on my last one. I don't even order gin and tonics when I'm out because I'm so obsessively-compulsively specific about my requirements. You may be wondering why I felt compelled to post about my evening cocktail. I was speaking to a friend recently about her dad, who is also a huge gin and tonic fan, and she said that he would be very sad about me buying gin in a plastic bottle and that I should splurge on some good stuff. I used to drink Boodles, but then I just drifted toward the ding-dang plastic bottle and that's where I've been.....UNTIL LAST WEEK. Last week I went to the state store to buy gin and came across the wondrous product pictured above. I had an epiphany!! It is LIME-FLAVORED GIN!!! Yes, yes, I hear you purists saying, "Hey, why don't you just have a wine cooler or a drink made with peach schnapps!! Don't put anything flavored in my gin!!" But you would be WRONG! This is the most delicious stuff put on this planet, I tell you. As a disclaimer: I am not an employee of Tanqueray Gin Company, nor do I receive any sort of celebrity endorsement compensation for this message. Now go out and buy some of this stuff!!! Bombay Sapphire. I can drink that stuff straight, it's very smooth. To me, the only other gin is Beefeater and that's a distant second. My favorite summer ritual is to come home, take off my pants, fix myself a London Buck and watch the bunnies in the backyard. But that's probably more than you want to know. London Buck: start with about an inch of crushed ice in a highball glass. Pour in the gin until it just covers the ice. Then top off with very dry ginger ale (I prefer Schweppes) and throw in a lemon slice. Don't stir, because that bruises the gin. Let the carbonation do the work. ks - reading about your ritual made me laugh with pleasure. Your ritual is almost as ritualized as my ritual! (though I generally keep my pants on). I shall try a London Buck immediately - it might be good to break up my routine. cg - you and your watermelon vodka! I'll have to try it and see what all your fuss is about.